Dr. Sothy Eng has joined the College of Tropical Agriculture and Human Resources (CTAHR) as assistant professor in the Department of Family and Consumer Sciences. Born and raised in Cambodia, Dr. Eng earned his Ph.D. in Human Development and Family Studies at Texas Tech University. Following a post-doc year at UCLA’s Center for Population Research, he took a position at Lehigh University’s College of Education as professor of practice of comparative and international education. There he worked with students engaged with Caring for Cambodia (CFC), a non-profit organization that builds tech-equipped schools and trains teachers in Cambodia. 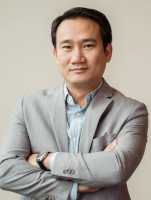 Dr. Eng’s research interests include: Cambodian education including access and equity, program development and evaluation, child and adolescent learning and development, family and community development, social capital, remarried families, gender-based violence, and international development.